Freightliner Sales and Service | El Paso | Doggett "
We first established our business in 1993. We are a locally owned, managed, and operated business. Get in touch with us at (915) 852-4922 for Freightliner sales and rentals in El Paso, TX. 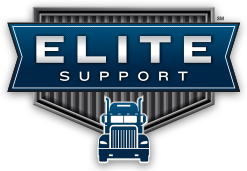 At our Elite Support certified El Paso dealership, our goal is to keep our customers’ trucks running down the road because we know uptime equals profits. To do this, we express assess every truck and take enormous pride in ensuring our technicians are the best trained in the industry. We also have over $10 million in parts inventory to keep you moving. There’s a reason you see so many Freightliner trucks driving through El Paso; they’re some of the most efficient and reliable trucks out there today. These trucks are a fantastic investment; not only are they rugged and long-lasting, but they also are extremely efficient and reliable. If you need a truck that has great fuel economy, Freightliner trucks are an excellent choice. Are you looking to purchase a Freightliner truck in El Paso? We can help you select the perfect model from our wide inventory. Maybe you aren’t in the market for purchasing quite yet? Then we also have a whole range of trucks available for rent. If you’re looking to purchase a Freightliner truck in El Paso, then we have a huge selection of Freightliner trucks available. Whether you’re looking for new or used trucks, we can help you select a truck that’ll perfectly suit your needs and keep you safe on the road for years to come. We at Doggett have a wide range of Freightliner trucks available. After you experience Freightliner trucks, you’ll see why so many people choose to rely on them. In certain situations, you may only need a truck for a short amount of time. For that, we’ve got you covered. We can supply you with one of our quality vehicles if you are looking to rent a Freightliner truck in El Paso. We do extensive checks on all our trucks, so you can rest assured your rented Freightliner will serve you well. If you are interested in renting, please give us a call and we’ll help you select the ideal Freightliner truck that’ll suit your company’s needs and budget. I-10 East to Exit 37 then turn left on Horizon Boulevard. The dealership is a ½ block on the left. I-10 West to Exit 37 then turn right on Horizon Boulevard. The dealership is a ½ block on the left. Need Freightliner servicing? Call now!